It's a good thing interviews don't have to be unbiased because I'm a big fan of Robert Fate. I've been a cheerleader for his Baby Shark series since the debut of Baby Shark. If you haven't heard of the author or his books, you will. Baby Shark has been optioned for a film (more on that in the interview). And, Bob himself is the ultimate Renaissance man. Now, I have the chance to introduce you to one of my favorite authors. I haven't met him, yet, but someday I'm going to get the chance. Lesa - Thank you, Bob, for taking time to answer questions for my readers. You know I've been a big fan ever since I read Baby Shark. It's a pleasure to introduce you to those readers who don't know your work. Would you tell us about yourself? RF: Well, let’s see––Robert Fate is my pen name. The name my mom and dad gave me is Robert Fate Bealmear. I was born at home. Doctor Holiday had delivered my three brothers and two sisters, so he and mom had the act down pretty solid by the time I showed up. I’m six-one and weigh over two hundred pounds, but I weighed less than five pounds at birth. No one ever expected me to be the size of my dad and brothers, but I finally made it. I was five-ten when I graduated high school and joined the Marines and six-one three years later when I returned home from Korea. The reason I’m telling you all this is to make it clear that I’ve been a late bloomer all my life. I wrote my first novel when I was seventy years old. I’m a Marine Corps veteran who lived in Paris, studied at the Sorbonne, and make my daughter laugh when I speak French. She is truly fluent in French and has never had an Okie accent. I’ve worked as an oilfield rough neck on a Texaco rig in Northeastern Oklahoma and a TV cameraman in Oklahoma City for a CBS affiliate. I was a fashion model in New York City for a few years to earn a living while I co-authored a stage play with a good buddy of mine. We never sold it. I was an entertainment project manager and later sold show scenery in Las Vegas after working as a chef in a Los Angeles restaurant, where Gourmet Magazineasked for my Gingerbread recipe—actually, it was my grandmother’s recipe. Along the way, I owned a company that airbrushed flowers on silk for the garment industry, and then I wrote scripts for the soap opera Search for Tomorrow. With the support and encouragement of Bruce Cook, a good friend, I produced an independent feature film, which shows up on late night TV now and again. Let’s see––as a Hollywood sp/fx technician, I won an Academy Award for Technical Achievement. I’m proud of that. You know, there’s more, but I’d be pushing my luck with the list above. I live in Los Angeles with my wife Fern, a yoga enthusiast and ceramic artist. Our fabulous daughter Jenny is a senior at USC. We have a dog, four cats, and a turtle named Pharrell. Lesa - I love the Baby Shark books. Would you introduce readers to Kristin Van Dijk and her stories? RF: Anything for you, Lesa. Kristin Van Dijk is seventeen on the first page of Baby Shark, book one in the series, a book that begins in October 1952. She is the principal character in a revenge-driven story of lost love set in a time in our history when women were flying below the radar. No one was predicting what women would be doing in the second half of the twentieth century. Kristin’s father was off at war and then off shooting pool most of her life. Then, after a year or so of finally having him to herself, he is brutally snatched from her. Things go terribly wrong one night in a roadside pool hall out near Abilene, Texas. 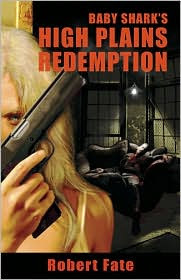 He is murdered before her eyes and she falls prey to unspeakable violence at the hands of a gang of vicious thugs. She survives but is scarred for life. Some girls would have rolled over and died, but Kristin wasn’t that kind of girl. Kristin is a protagonist with the strength and resolve to come back from the worst that can be thrown at her, and then rise from the ashes, seek revenge, and exact it without remorse. Kristin Van Dijk takes no prisoners, but she is not a cartoon character. She lives in a world of reality where cuts bleed and guns kill. Only a female could be a Baby Shark kind of protagonist, a protagonist loose in a man’s world, in a hostile western environment with her back against the wall, where no matter her age she would be considered a “girl.” When I was writing Baby Shark, I wanted a girl with a gun in her hand and the will to follow through, a girl who wasn’t going to stand for it anymore. That was how Baby Shark was born. Lesa - How did you come up with Kristin's character, a female pool hustler? And why are the books set in Texas and Oklahoma in the 1950s? RF - That guy who does all my writing for me while I’m daydreaming in alpha-state came up with Kristin Van Dijk. All kidding aside, I “came back” from staring out the window and there she was. Not totally, but a little at a time––young, platinum blonde, all in black, tight jeans, boots, well-read, taciturn, and dedicated to instant mayhem if you cross her. I liked the idea of a woman shooting pool and had been thinking about a character doing that for––well, I clipped some pictures from a magazine of women shooting pool maybe ten years ago, because I thought it was a cool thing. Women poker players are cool, too. Women are good at reading faces, certainly better than most men, so they’re good at poker and pool. I always think a man trying to fool or lie to a woman has to be asking for trouble. Their senses are superior all the way around. “No, I didn’t smoke a cigarette,” the husband says after the wife smelled smoke on his clothes the instant he walked in the front door. Then it was a matter of giving her an environment that justified her knowledge of pool and circumstances that led her to a cold understanding of how, when, and why to use guns and knives, and Kristin was on the page to stay. I think the characters around her help define who she is, as well. Contradictions are necessary in a full-blown character. Don’t you agree? First of all, nobody is perfect. And then also, I find gray much more interesting than black and white. Baby Shark is basically a good girl who learns to be dangerous and even bad if she has to be. I think she sometimes acts out in ways we all would like to do if we were a little braver. Kristin has been a victim, and it wasn’t pretty. She never plans to be a victim again. Treat her with respect and you have nothing to worry about. Mess with her and look out. She understands that violence is a solution. The 1950s seem to me to be a period in our history that falls too easily into parodies of mom and apple pie. Angst-ridden movies such as The Wild Oneand Rebel Without a Cause were closer to the feelings I remember. I graduated high school in 1953. The 50s are real to me. I wanted the series set in a time before cell phones, computers, and drug related shootouts. The 1950s work for these stories because I wanted my young female protagonist challenged by a world formed by late nineteenth and early twentieth century attitudes toward women that Rosie the Riveter knocked silly. Women of the Eisenhower era were much more restless than Ozzie & Harriet would have had people believe, and I wanted to tap into that with a strong, young female protagonist who could represent that unconventional spirit. Seeing a woman cut a new path has always seemed an interesting storyline to me. Why Texas? Limitless space. Unlimited characters. Anything can happen there. And everyone owns a gun. How often have you, yourself, said after hearing about some bizarre event that happened in Texas, “Well, after all, that’s Texas.” I rest my case. Lesa - Congratulations, Bob. Your first two books, Baby Shark, and Baby Shark's Beaumont Blues, were Anthony Award nominees. Then Baby Shark was optioned for a film. Can you tell us about the film option? RF - Thanks for the congrats. I’ve been lucky that Kristin, Otis, and Henry have let me tag along. Oh, and Jim––can’t forget him or I’ll get letters. Ah, the movie. Here’s the background. The senior editor at Capital Crime Press gave me a call in December 2007. He said he had given Baby Shark to a Hollywood producer and that the feedback was he might be interested in making it as a motion picture. That, in itself, never means much, but this producer wanted a meeting with me to discuss the idea of Baby Shark as a film––that could mean something. The editor asked me to take the meeting. I live in Los Angeles; the producer has offices in Beverly Hills. I drove over. The producer is Brad Wyman, a smart, talented guy with an impressive list of productions, including Monster, the film that starred Charlize Theron in an Oscar-winning role. He was friendly, respectful, and sincerely interested in the story. We had a good meeting and after I left, and before I got back to where my car was parked, my cell phone rang. It was the editor at CCP. Brad Wyman had called and wanted to option Baby Shark. That was good news. Baby Shark was my first novel. Hell, I felt extraordinarily fortunate to have gotten it written––much less to have found a publisher and established a small, but loyal readership. And now it was to be a motion picture? Of course, that was December 2007. The agreement was finalized in the spring of 2008 after a friendly and relatively fast negotiation. Brad Wyman had purchased the film and TV rights to Baby Shark and assigned the book to a screenwriter. The plan was to shoot the movie in 2009. In June 2008, the Screen Actors Guild and Hollywood Producers began to squabble over the signing of a new agreement and work in the industry slowed down to a crawl. The squabble continued for a year, costing Los Angeles and workers and suppliers to the motion picture industry billions in lost revenue, and way down on the list of casualties was Baby Shark, the movie. I’m happy to say the squabble ended in June 2009, and the word from Brad Wyman is hopeful. Baby Shark is back on schedule and may actually get produced this year, after all. Brad casts his movies with a savvy eye and has launched some fabulous careers. I trust him to come up with a great script, make the proper changes necessary to turn a novel into a film, cast Baby, Otis, Henry, et al with sensitivity, and choose a director that will get the job done. So, 2009 looks hopeful for the production of the film with a release date maybe as early as spring 2010. My fingers are crossed. Cross yours, too. Lesa - It's been a few years since you and I kicked around ideas for film casting. I know the author doesn't have any say in that. But, who do you picture in the roles of Kristin and Otis? Are there any other roles you would enjoy casting for Baby Shark? RF - Lesa, you have watched me from the beginning keep the Baby Shark book covers purposely vague about Kristin’s looks. We know she is five seven, weighs in at 125 to 130, depending on her exercise schedule, and is a platinum blonde with Dutch heritage. She is far from being a girlie-girl. Tomboyish is more her style, but men find her attractive and plenty say so. My guess is the actress who captures the role of Kristin in the movie will be in her mid-to-late twenties, but be able to play younger. She must be able to take on the physical challenge and be convincingly tough in male-dominated environments, i.e., poolrooms and such, and yet be able to show a tender heart. But, who exactly from Hollywood is right for that––I really can’t say. In fact, I have assiduously kept myself from going there. Sorry. I will be as surprised as you when the actress is signed. And Otis? A bigger-than-life kind of guy who commands attention and engenders fear in bad men who know he will not hesitate to kill them. A sincerely scary guy you are relieved to learn is on your side. That’s Otis. Again, who will that be? Can’t say. But I am as interested as you to find out. Maybe we won’t have to wait much longer. Lesa - Bob, you've had a number of occupations in your life. What has surprised you about the writing profession, and, particularly, the crime-writing field? RF - The surprise was the community of mystery readers and writers, the fans, the librarians, this was the big surprise for me. I came into this from way outside. I had no idea this world existed when I decided to write a crime novel. I was suffering from unbelievable naivety. When I attended Bouchercon in Madison, I was totally green. Everything was new to me; the number of fans stunned me––the curiosity, the friendliness, the knowledge, the organization behind such a big undertaking, the courtesy shown a new guy, the willingness to lend a helping hand from all sides. Holy smokes! Who wudda thunk it? The hard-working, world-wise librarians I met (and still meet) had seen guys like me show up and go away more often than I wanted to hear about. I saw the reality of it––a writer has to prove it. You’re only as good as your last novel or you will simply be known for the one that caught some attention for a minute or two, a one trick pony. that’s spring 2010, Kill The Gigolo, my first stand-alone, will be released. It’s simple enough. I decided to fish. The really big surprise––I love this community, this no nonsense bunch of mystery readers who keep a writer honest. Talk about calling a spade a spade––they either buy your book or they don’t. But along with the criticism has come a willingness to read the next one to see if the lessons are being learned. I always thought writing was a lonely business, but it’s not, and I like it this way. I’m trying to get better at what I do. I truly don’t want to get off the train. Lesa - Would you tell us what you're working on now? RF - I’d love to. I decided to slip in a stand-alone between books four and five of the Baby Shark series. I see this as an opportunity to tell a different story, give us all a change of pace. Al Foley, the Boston Godfather, didn’t have his boys simply kill Freddy Bledsoe. He had him mutilated by an IRA fugitive he harbored. So Freddy spent the final few terror-filled minutes of his life staggering about disrupting traffic at Broadway and Amsterdam until he collapsed and died from loss of blood. The New York Post bought up every nasty cell phone picture taken of Freddy’s departure. Which meant most of the city had its nose in some mob business, and the feeling was the business was unfinished. The city held its breath; who would be next? That would be Erik Lamar if Al Foley had his way. Because what got his friend Freddy murdered, Erik was a part of. It was an incident really, a small matter in the overall scheme of things, but the old Irish mobster didn’t see it that way. So Erik got it––what happened to Freddy was a Girl Scout demerit compared to what was planned for him. But first Al Foley had to catch him, and Erik was headed for Mexico––unfortunately, it was out of the frying pan and into the fire. Kill The Gigolo will be released in spring 2010, and book five in the Baby Shark series (no title yet) will hit the stores in September 2010. Lesa - Before I ask my final question, is there anything you would like to discuss that I might have missed? RF - You mean something other than how wonderful you are, and how much I appreciate you chancing the ire of your readership by interviewing me? My mother told me once after my father had passed, that when I was a pre-teen and running around like a crazy person, he told her, “If Bobby drowns, look for him upstream.” I’ve always thought there was some prescience in his comment. Thank you for watching for me upstream. Lesa - Thank you, Bob. You know I'm a public librarian. I always end my interviews with the same question. Do you have any special memories or comments about libraries? RF - Libraries rock. I am asked to speak and sign books at libraries and am never disappointed at those events. I look forward to them and encourage librarians to invite me. I clean up pretty good and keep a civil tongue, for the most part. I have a car, a license to drive, and I bring my own pen. You’d be surprised how unafraid of distance I am. In fact, I should mention that my friend and fellow author, Bruce Cook and I make a dynamic duo and are often asked to speak together. A twofer, you might say. We’ve actually been known to draw a crowd. Also, while I have the chance to speak to librarians (or to others if interested), as I did last year, I am going to offer a free PDF of one of my novels during the months of July and August. So, if you are a librarian, don’t have the budget to try as many new writers as you might like, here is an opportunity to snag one of mine for free to see what you think about a serious purchase up the line when budgets ease up. 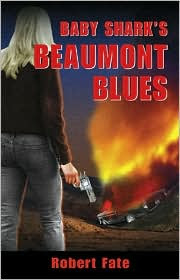 A PDF of Baby Shark’s Beaumont Blues will be offered for free at robertfate.com during July and August 2009. Thank you, Bob. I really appreciate it. Now my readers know more about one of my favorite authors. And, I bet most of them won't be disappointed in Baby Shark's Beaumont Blues. So I hope you take a chance and try the PDF. You'll need to know about Bob's books before Baby Shark, the movie, comes out! 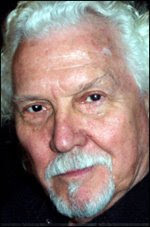 All of Robert Fate's books are published by Capital Crime Press. Great interview! For a late bloomer you aren't letting much grass grow under your feet. I loved hearing how Baby Shark came to be. You're right, Pat. Maybe I'll start over at 70, just as Bob and Alan Bradley did. Baby Shark has been on my list to read for a...shoot. At least a year. Maybe it's time I read it!! I think it's time you read it, Maria. You don't want to be reading it AFTER the movie comes out! Lesa is right. The book is a jewel. Who knows what Hollywood will do to it? Nothing bad, I hope, like casting -- oh, say, Paris Hilton -- as Baby Shark. You almost made me gag with that suggestion. NO! If Bob is right, I think he has a producer he can trust. Let's hope so! I'm also a huge Baby Shark and Bob Fate fan. So count me in on also getting a copy of the standalone! I'm glad to count you in as another Baby Shark & Bob Fate fan. He'll be glad he has someone else waiting for the standalone. If you like gritty, tough heroines, you'll appreciate Baby Shark. Thanks for great interview Lisa. I love the Baby Shark series and emailed Bob back in Feb. because I couldn't stand not knowing when the next is coming out. I'm even more excited now knowing that a stand-alone is also in the works. You're welcome, Mack. Thanks for stopping by to read the interview! Glad you're excited about Bob's standalone. That was so nice for you. And, I know Bob has a big heart. He wouldn't give up on loving you just because you aren't working! Great interview, Lesa! Those are great questions and Bob did a great job with the answers too. I've read the first three books in the Baby Shark series and enjoyed all of them. 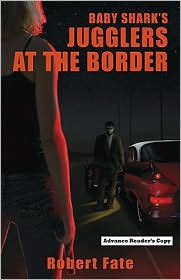 I'm looking forward to reading the latest Jugglers at the Border. Thank you, Alice. You're right. Baby Shark does rock. And, I'm looking forward to the book, too. I've had the good fortune to appear on a panel with Bob, and let me tell ya, he's just as interesting in person as he is on the page! :) Go, Bob! That's wonderful to know. I'm always pleased to hear the authors I like via correspondence are just as nice in person. I think Bob has a cult following. And, we all need to keep our fingers crossed for that movie.